So, just a quick update (that's a bit of a lie) about how my last lot of chemotherapy went and then I'll let you all know how my radiotherapy planning went today. Chemo went alright last time, had a few hiccups but I expected it cos nothing is ever straight forward with me lol. I ended up being disconnected a day early (last Thursday) because my heart was racing, I went for an ECG and everything was okay. I am still getting palpatations but no where near as often as I was. 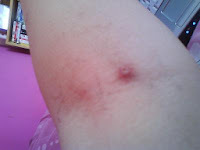 I'm still getting hot flushes...which I thought were because of the steroids but I haven't taken them for a while so it can't be them! It must be hormonal...all I know is, I hate them. I'm having one right now lol. I just want to say thank you to all the chemo nurses at Broomfield Hospital - you are all wonderful! I really am grateful for everything you've done for me over the past couple of months. Thank you. Today was my radiotherapy planning, my appointment was at 10:45am and we were a little bit late because there was no parking spaces! We didn't have to wait long at all, got called in by a nice lady (who said she was off to read my blog so hello! lol) and waited in a room for my oncologist, Dr Tahir to come in. He explained all of the side effects of radiotherapy - the skin might get sore on my neck and I might have difficulty swallowing (but I might not, so the PEG is just in case). I think that's the main side effect, I have to read all the leaflets and stuff to see if there's anymore as I can't remember right now! Dr Tahir said that I will cope okay with this radiotherapy and it's nothing compared to the chemotherapy I had (which I didn't think was that bad!!) - I was really relieved to hear that because I was more worried about this than I was the chemo. I will be having chemotherapy 1 day a week for 6 weeks (while I'm having the radiotherapy) - this is a different drug called carboplatin. Which is apparently similar to the cisplatin that I was having, but it has less side effects. The main side effect is kidney problems so I have to remember to drink loads and loads for some days afterwards. I then signed some stuff to stay I knew all of the side effects. OH - I forgot to say. MY HAIR IS GOING TO START GROWING BACK. WOHOO!! The chemo drug I'm having doesn't cause hair loss. I am really excited. I do still have some left, it's like fluffy and light on top and then I have a little ponytail at the back lol. I think I am going to have to cut it off though and shave the rest of my head because when my hair grows back it will grow back completely different to how it was before. It's actually hard to imagine myself with a whole head of hair right now lol, when I look at pictures of me with hair and it's just strange! I really love Dr Tahir, he's so nice. I like it because he treats me like an adult, where as I've come across some people who talk to my Mum about me. I know I'm only just 18 - but I am an adult and it's happening to me, so tell me about it! Lol. Only a FEW people have made me feel like a child though and it's not their fault as I am young and have my Mum with me all the time. When I saw the Dr a few weeks ago at Broomfield I looked on the screen when he was looking at the results from my last CT scan and it said "Lympth nodes shrunk, tumour not responded" or something like that and I was thinking 'What the hell? I was told the tumour has shrunk!! And I've seen pictures to prove it!!" Lol. So, my Mum asked Dr Tahir about it and he said that is HAS responded and to just ignore what the computer screen said. I start my radiotherapy on the 25th (I think) of February. I thought I'd be having a nice 4 week break but obviously not, lol. I don't mind, the sooner the better - eh? 5 days a week for 7 weeks...I was meant to be getting my PEG fitted on the 28th but Dr Tahir said he is going to try and change it so it's the week before I start radiotherapy because I might be a bit too sore to lay down so flat for a couple of days afterwards it's put in. I'm pretty nervous about having it fitted - but I know I'll be fine. 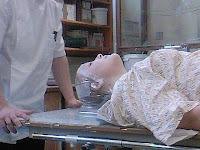 I'm going to be sedated which I don't like the thought of cos I don't like not being in control. Haha. Plus, I wont be able to hold my Mum's hand while it's happening! Hopefully, there will be someone with a free hand to squeeze! I also asked Dr Tahir when he thinks it's worth starting to work on my voice and he said that he'd contact my speech therapist and then she'll contact me. I'm looking forward to having a voice, even though I've got pretty good at whispering loudly! Haha. Sometimes when I'm out I notice people looking at me when I'm talking and they probably think "How rude is that girl whispering?" lol. My voice isn't coming out again...it makes this strange noise. I suppose it just needs a lot of working as it hasn't been used properly (well, what I thought was properly!) since October the 17th to be precise lol. 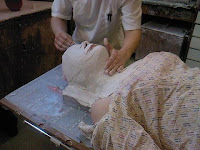 After speaking to Dr Tahir I went to get my mask made for radiotherapy, basically I had to have a mould of my face (and part of my chest) done so that I don't move when I'm having the radio. They have to be SO precise so they don't damage any other tissue - so I will be like stuck down to the table while it's happening, haha. 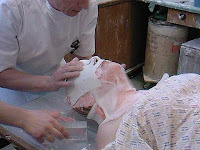 I went in to the room and there were two men (both called Paul) and I had to put a gown on and lay down on this wooden bench thing, they then put some goopy stuff on my face and then put strips of plaster on me to set and then that would make the mould. It wasn't the most pleasant thing in the world and I didn't like the part when they covered my eyes cos it reminded me of having a night terror (you know when you're trying to wake up and your eyes wont open?) - I think it took about 10, 15 minutes for it to all be done but my Mum was there to hold my hand (thanks Mum) lol and I just kept trying to think of other things. It felt a bit horrible when they pulled it off but I was so relieved, haha. BUT it was no where near as terrifying as I expected so if anyone reads this - and is having it done, don't worry. It's all good and it's over in no time. 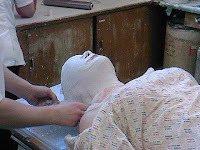 Pete took loads of pictures of the process, I look like a Mummy!! Don't I look attractive? In the top left picture you can slightly see the little bit of hair I have left lol. moose heads and stuff. Lmao. I'm just kidding...but I'll keep it and show it off to people, haha. And I think that's pretty much all I have to say...this was SO long. I don't know when I'll update again, I know I need to do it more often but it takes me so long to type all this and I can never be bothered, haha. Thanks again for all your lovely comments, I love getting them so leave me some more!! P.S Sorry about how messed up the positioning of the pictures and text is, I've been trying to fix it but I'm getting impatient so I give up lol. Words come easy to some people, remember, those who most care, are always there, by your side when you need them most. Sounds positive for you Hayley, Woo! I nearly pmsl at some of your comments especially regarding your 'mask' and hanging it like a moose's head on the wall! An ex work mate of mine who had fairly thin, poker straight hair went through chemo, and when here hair grew back it was thick and curly! How on earth does that happen? I dunno! Good luck for the radiotherapy starting. Hellooo! It's 'the nice lady' here who went off to read your BLOG! It took me a little while to read all of your experiences (i don't get much time off working for the NHS! lol)but i was very impressed by you and what you had written. I am constantly inspired by the people (such as yourself) that i meet here but you really do stand out! It is not just your age but your level of maturity, your apparent wicked sense of humour but most of all your enormously positive attitude. Keep it up!!!!!!!!!!!!!!!!!! I did laugh a lot at the t shirt you had made and thought maybe you should sell them in our waiting area? lol what do you think? I reckon that you would make a fortune! i think the pics are positioned lovely i was actually thinking it as i went down lmao!!! u look like u had fun... at least u didnt have a cold with that mask thing u'd choke trying to cough. 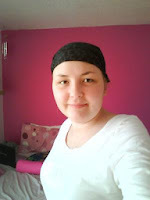 dont think i could stay stillt hat long they'd hate me..
ull be fine with radiotheraphy. cant believe they have made it all so clsoe togethere but like u say sooner the better and the sooner the quicker its gone and u can talk. ill piss myself if u get ginger hair and come back talking like a 2 year old :P hehe. love u really. well...look how far you've come...a little way more to go before it's over! I know you don't think so, but you're one STRONG young lady! You can hold my hand any time sweetheart! god you are one strong woman to go through all that..dont no wot else to say sorry.. It's so fab that your hair is growing back already! See, told you so :p Though now I'm totally imagining you with an afro, or curly blonde hair, something entirely different lol! It's so hard to remember everything that you have said lol. On that first picture of you when you say you can see your hair, it actually looks like you've got your normal amount of hair, like you used to have. I love you, you're the best. I want to say more but I forgot everything I've just read. It's cos I'm an old lady. Do you remember when you always used to call me old?? You look like you coped with the mask fitting really well! It looks like something out of Dr Who or the movies! Very strange experience I bet! I know how much you have been dreading this portion of the treatment but I thought that Dr Tahir's comment was very comforting - if you thought that the chemo was "not too bad" then hopefully, this will be a doddle. We look forward to seeing you this week hopefully. We are free Wednesday or Thursday, let me know what suits you and what you fancy doing. I'm the mom who's 22 year old son had tongue cancer last summer. Just wanted to let you know that I still read your blog, I'm still impressed with your spirit and your amazing blogging abilities. I also wanted to tell you that the other day my son said, "Sometimes it's hard for me to believe that I really did have cancer." I hope, one day soon, you'll say the same thing too. 6kop - that was my cat's comment. She just walked across the keyboard.